This year, I decided to participate in the Goodreads Reading Challenge for the first time. I figured that challenging myself to read 100 books would be acceptable since I only really had a specific window in which I could read for pleasure: over Christmas vacation, during Reading Week (while taking a break from studying for midterms, of course) and over my summer vacation. 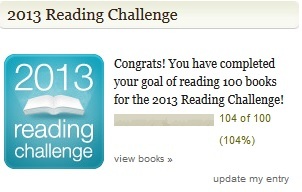 Not only did I meet my goal of 100 books, but I surpassed it – with two months of summer vacation remaining! If you’re interested, you can see the books that I read here, and you can add me as a friend on Goodreads here. What are your 2013 reading goals?